With the prime ministers of Japan and Australia, the US secretary of defense (and other defense ministers in the region), and the Republican presidential candidate issuing statements on the future of Asia over the past month, it has been a fascinating time to ponder the shape of the region over the coming years, especially as the US transitions into the post-Bush era. William Overholt, director of the RAND Corporation's Center for Asia Pacific Policy, has produced an indispensable contribution to that discussion in Asia, America, and The Transformation of Geopolitics. 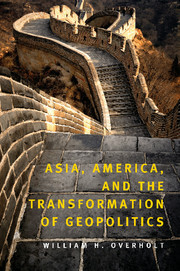 In this book, Mr. Overholt examines the transition from the post-cold war to the post-post-cold war period in Asia. He has a clear purpose in doing so: Mr. Overholt thinks that the US did an extraordinary job winning the cold war in Asia by contributing to the development of Japan, South Korea, and countries in Southeast Asia (putting development before democracy), and using its alliance with Japan to stifle Sino-Japanese antagonism (defending Japan from China, while restraining Japan to ease Chinese fears). He fears that the US insufficiently appreciates the scale of its achievement in Asia — the creation of a peaceful, stable, and prosperous Asia — and risks blundering down the road that leads to war and ruin for the region because of misguided fears of China. The result is a thoroughly researched polemic, one that may not sit well with American policymakers (or Japanese policymakers, for that matter). I am deeply sympathetic with Mr. Overholt's purpose in this book. Like him, I think the task for US Asia policy is to continue to guarantee stability in the region, and must abjure from policies that undermine stability (i.e., values-based diplomacy, a league of democracies comprised of members conveniently located on all sides of China, etc.). Accordingly, the US-Japan alliance's purpose must reflect the overall US mission in Asia — the alliance must also abjure from destabilizing actions. Mr. Overholt fears that the Bush administration's Japan policy — and Asia policy more broadly — has deviated from the goal of ensuring stability and prosperity throughout Asia. He is concerned that the US-Japan alliance has become an alliance with the Japanese right, and increasingly serves their goals, many of which are prejudicial to stability in the region. He does not make the mistake that some do in equating the ideas of Japanese conservatives with those of the Japanese public at large. He argues instead that the Japanese conservatives have gained prominence because they're operating in a vacuum: "The Japanese public generally does not have strong views or even strong awareness of foreign-policy and national-security issues. In this situation, Prime Minister Koizumi's appointment of hawkish nationalists to key positions, U.S. pressures for a stronger military and a more explicitly anti-China military posture, and China's nationalist excesses have permitted the nationalists to gain a disproportionate influence over Japan's national-security policies" (81). He is fearful that the alliance between US and Japanese conservatives that has deepened since 2001 risks explicitly directing the alliance against China, and consequently setting the region down a more confrontational path. He is also concerned about Japan's continuing regional and international diplomatic, economic, and intellectual isolation, which the conservatives have done little to reverse in their pursuit of a "beautiful country." If they wished to, Japan's leaders could inspire their people and the world with a vision of social maturity; of increasingly wise employment of women and older people and of competition and globalization to achieve grwoth in an economy with a graying and declining population; of peace through integration with and understanding of their neighbors; and of sustainable environmental practices in which Japan is poised to lead the world. Elements of all these are in place. But so far, instead of inspiring their people with a grand vision of the future, the new era's leaders have preferred to prettify a difficult past. The picture is of a Japanese leadership that has squandered opportunities, and in doing so not only put the region at risk but failed to provide a secure future for the Japanese people. Turning to China, Mr. Overholt is optimistic, seeing a regime that is cautiously exploring political reforms to follow its economic reforms. He views China as better placed to serve as a regional leader, precisely because of its openness, economic and otherwise. He does not reject the possibility that China's foreign policy could move in a belligerent direction, but he is confident that barring major disruptions China will moderate politically and become a responsible leader in the region. While not excusing China's overblown responses to Japanese revisionism (overblown in light of China's own historical revisionism), Mr. Overholt suggests that the "militarization" of the US-Japan alliance may be more destabilizing than the rise of China. In short, the US needs to achieve a better balance in its relationships with Japan and China. In subsequent chapters he looks at conditions on the Korean peninsula and the Taiwan strait, in Southeast Asia, India, Russia, and Washington, D.C. (i.e., US foreign policy). The thrust is the same throughout: for a hopeful Asian future in which war becomes unthinkable, the US needs to focus on how it was able to stabilize Asia during the cold war, and adjust its Asia policies accordingly. It needs to demilitarize its foreign policy, embedding its defense policy in a broader context instead of letting defense policy determine the whole of foreign policy. Doing so will enable the US to marshal its influence in the region and solidify its position as "resident power" for decades to come. Your in-depth analysis and review of this book is very, very impressive. I find myself disgracefully not-knowledgeable about many facets of international history, and how other countries (such as Japan, and China) -- their history, their politics, their cultures -- affect our own country. So I've been working at filling in some of the holes. Yuan-tsung Chen has written a really interesting book, "Return to Middle Kingdom," blending biography with Chinese history. It's an insider's account of the Cultural Revolution that unravels the perplexities of modern Chinese history for the reader, covering the past century and a half. It's an engrossing read. Thanks for the heads up and excellent review of this book which led me to order it.